Oakland, California 2017! — I returned. I love Oakland mostly because folks there are like folks in NY. They show LOVE. Arrived at my 10 day residency ready to rock with homegirl Dime. Dime and I met back in 2009? I forget. I was invited to paint with Meme of Few & Far at their very first wall and Dime rolled by to meet us. 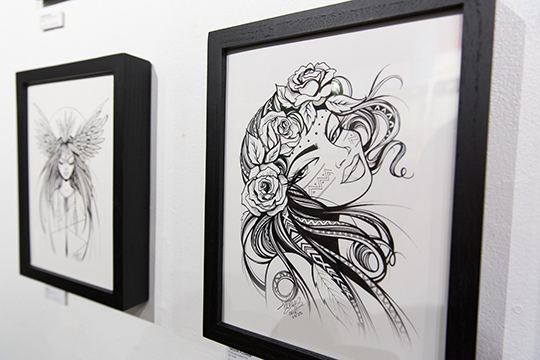 I checked out her work and got her down on the wall along with Agana. 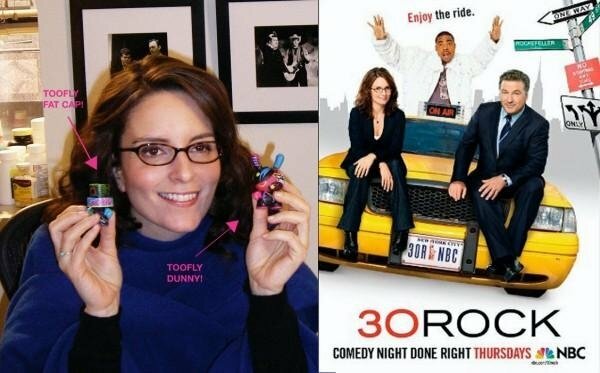 Every time we had a Few & Far wall Dime and I tried to collaborate. We always felt our styles worked great together + we connected right away because of our latin roots. 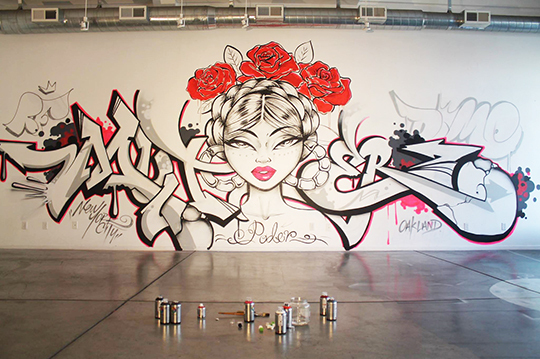 Dime has a sharp classic graffiti lettering style that goes really well with the Toofly flows and characters. 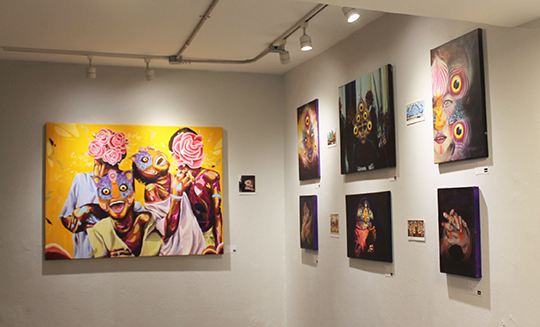 Dime had an opportunity to curate a show at East Side Arts Alliance new gallery space and worked to get the grant. So grateful! it helped cover all our expenses and stipends. Thank you Dime! 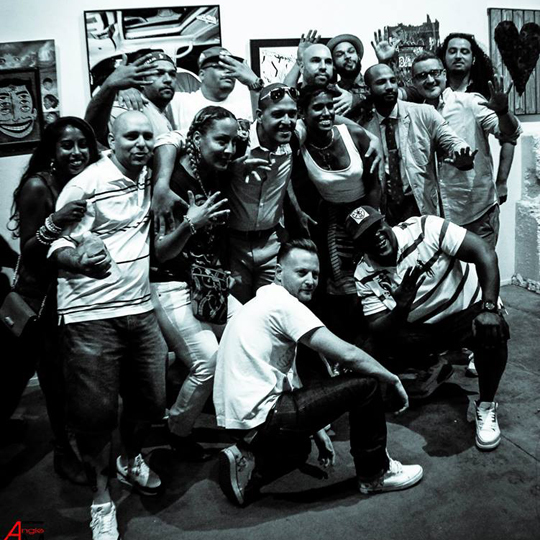 Thank you East Art Alliance! 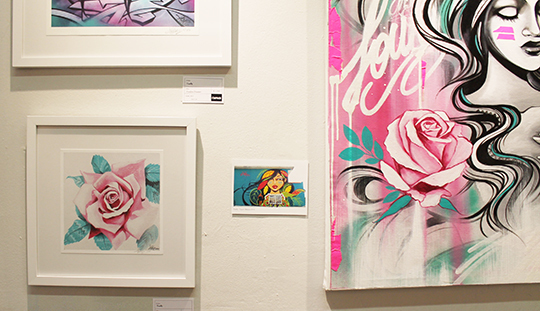 We rocked a beautiful exhibition, installation, workshop and pop-up event entitled “Grafiteras” Check it out! 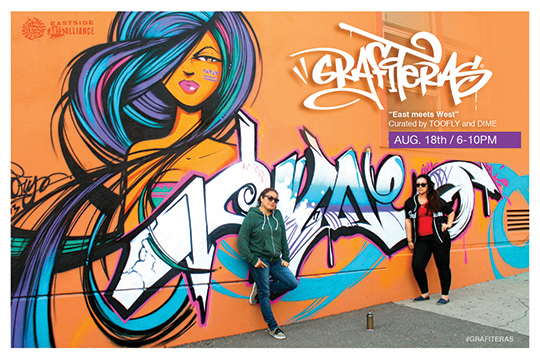 July 18th, 2017 OAKLAND, CA — On Friday August 18th, 6-10pm famed graffiti and street artists Toofly (NYC), and Dime (OAKLAND) team up for GRAFITERAS, a collaborative exhibition, installation, pop-up, and art workshop all in one. 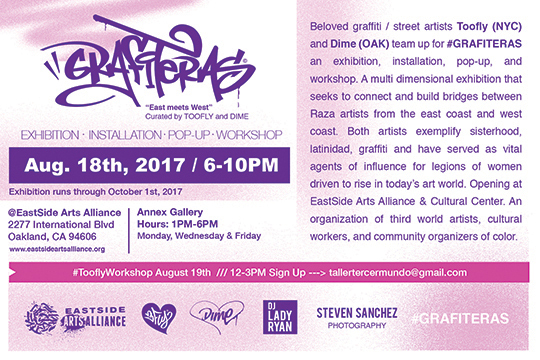 GRAFITERAS will be held at EastSide Arts Alliance & Cultural Center, a grassroots organization of third world artists, cultural workers, and community organizers of color. 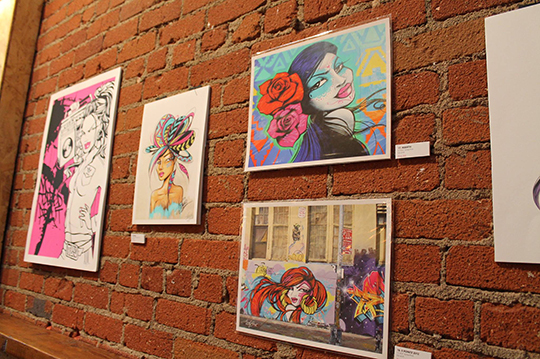 GRAFITERAS is a multi dimensional exhibition that seeks to connect and build bridges between Raza artists from the east coast and west coast. 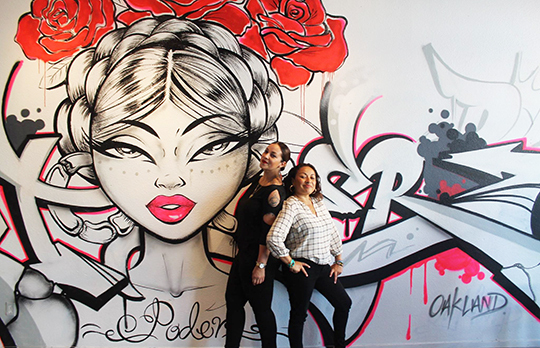 Both artists exemplify sisterhood, latinidad, graffiti and have served as vital agents of influence for legions of women driven to rise in today’s art world. Both women were raised in the tumultuous 90s era. 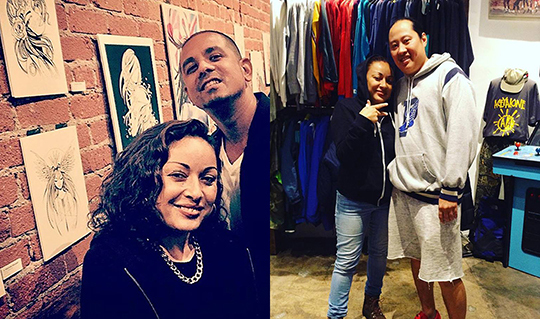 Toofly hails from Corona, Queens NY, Dime from Oakland, California. 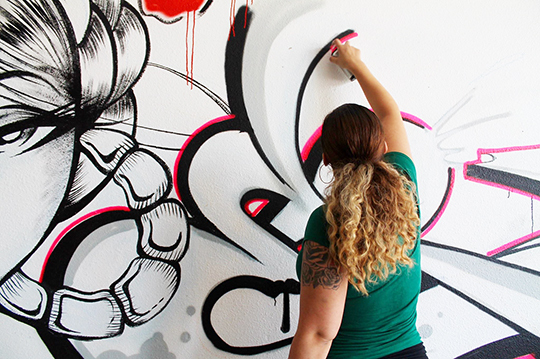 As young graffiti artists they made their mark in a male dominated graffiti scene. The challenges of being immigrant and brown women did not deter their journey of self-discovery. In fact, it influenced the trailblazing art they create today. 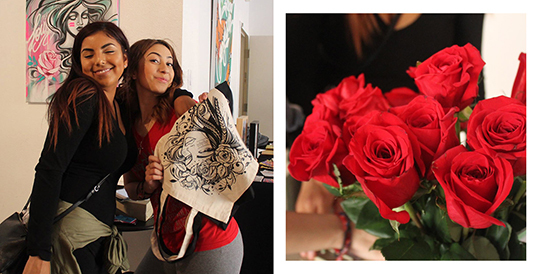 They were determined with mucho corazon which comes from instinctual feelings of love and community. Through their art, they not only represent themselves but the dreams, ideals and instincts of women, particularly Raza women. 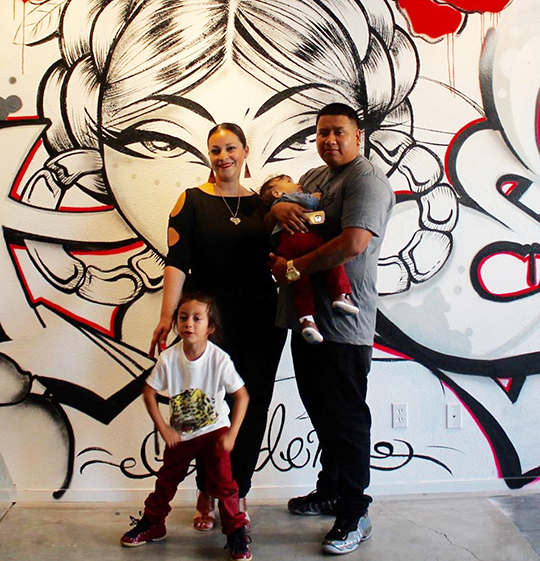 Over the years they have carved out an important artistic space at the intersection of street graffiti, murals, and exhibitions—on their own terms, staying true to their roots and love for community. Eventually, the forces of the universe brought them together as grafiteras. 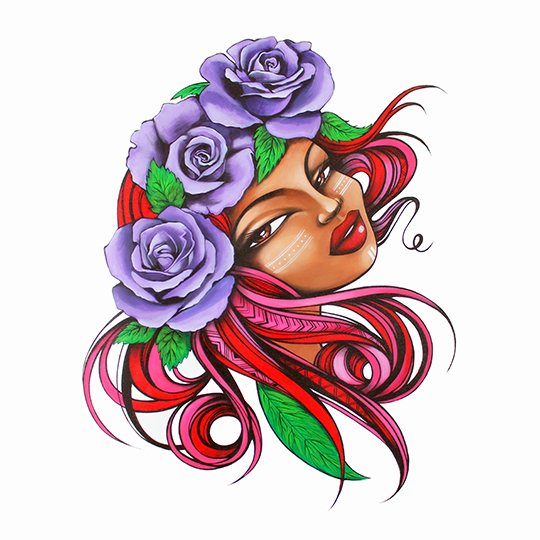 To be “Latina” or to be “Raza” in America means you celebrate two or more cultures through language, art, cultural traditions, music, and food. 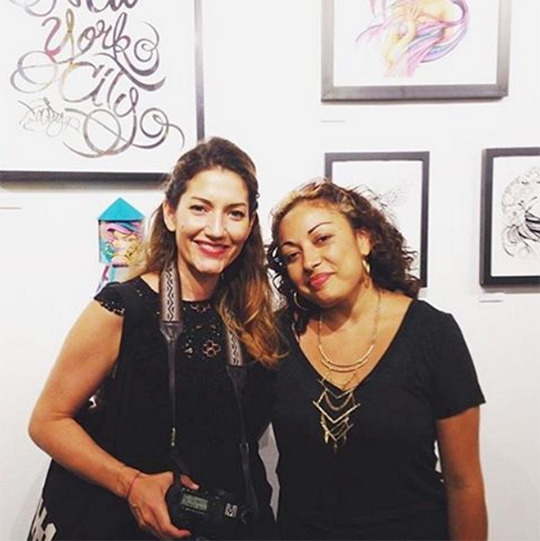 As daughters of families who at one point migrated to the states in search of greater opportunity and economic security, both women understand the power of their art in telling the story of immigrant families. 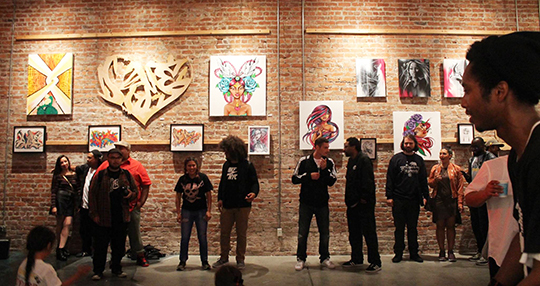 In the face of struggle in a country of institutionalized racism, racial profiling, and an anti-immigrant legal systems, Toofly and Dime respond with art that uplifts, engages and promotes the inclusion of their communities. They have faced racism, and discrimination and so have their family members and peers. It is part of their lives and what gives them a thick skin in the face of adversity. This is what makes women strong, what makes them warriors. They are part of a growing generation of people of color who stand up for what they believe in and will weaponize their art to share their truths. Resistance is part of their culture, it’s in their blood. 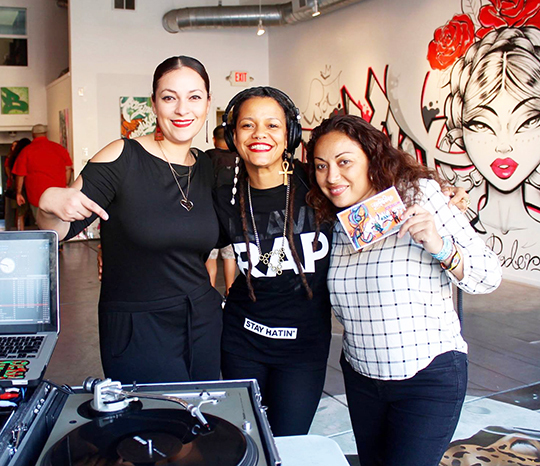 Today, “Latina Americanas” like Toofly and Dime, are also spreading their craft into the broader society as educators, designers, educators, and community organizers. 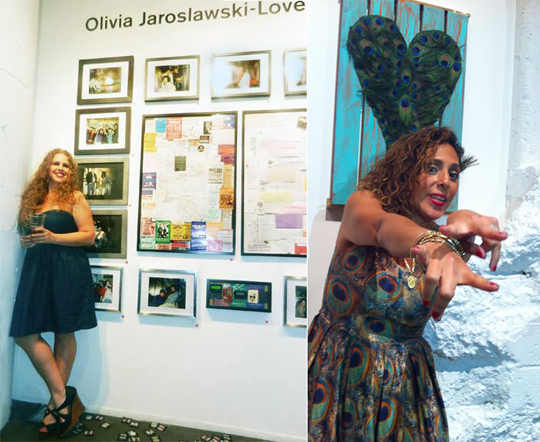 It has become the path of self determination for women artists who hold the roles of mothers, daughters, sisters, and aspiring professional storytellers. 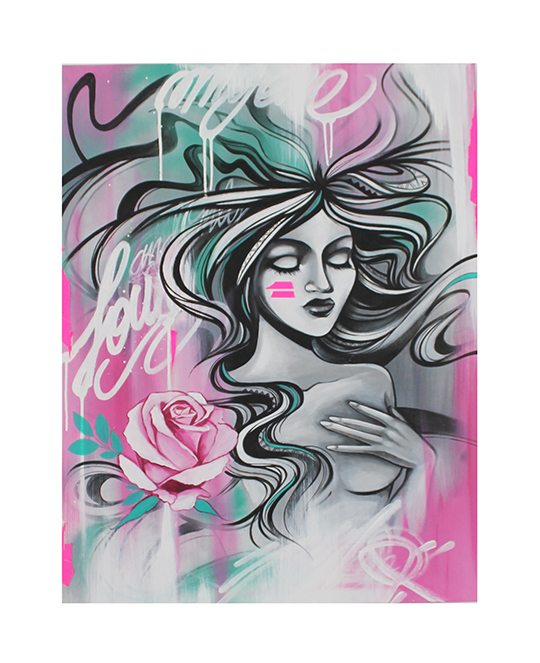 As grafiteras they have a complex story that speaks volumes of the strength and love that is needed to inspire and move society. 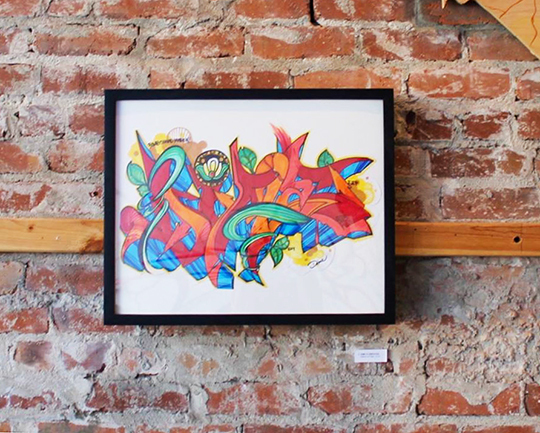 GRAFITERAS is a powerful initiation to the complexity of what it’s like to grow up in America, and how Raza and many other cultures find a way to stand up, rise, and shine through it all. Join us! 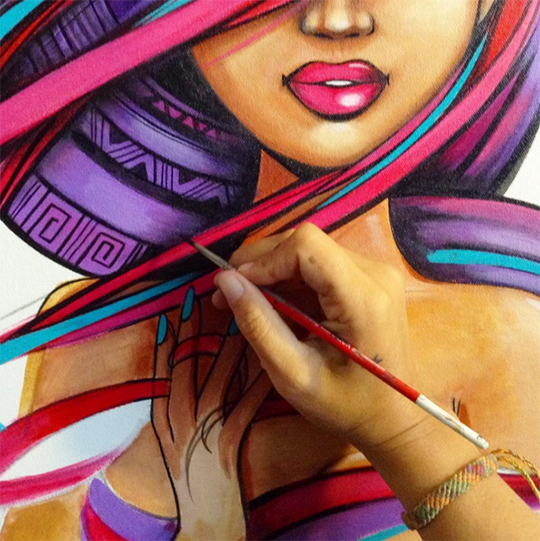 Let’s celebrate women artists today who are the rainbow warriors of the new world. 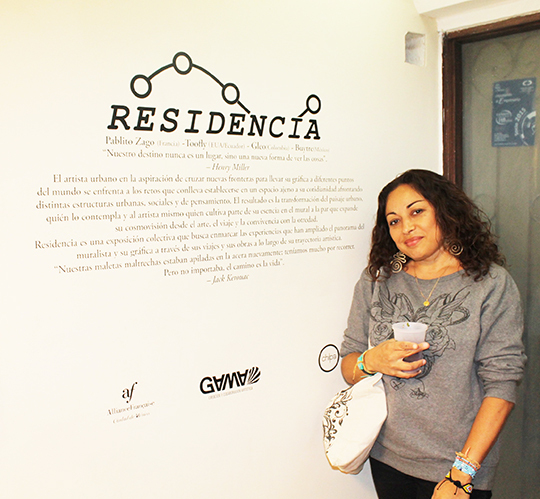 Maria Castillo known as “TOOFLY” is an international Ecuadorian/NYC artist, curator, and social entrepreneur. 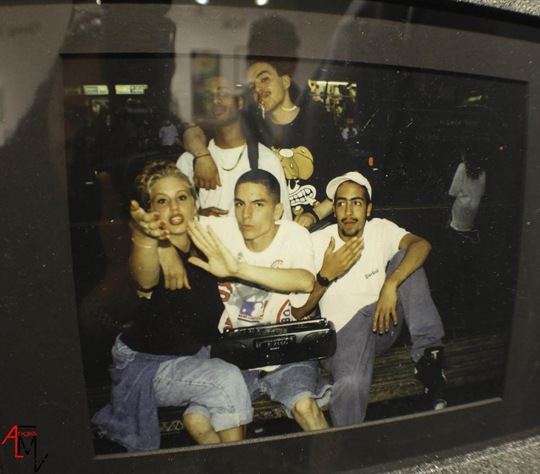 Recognized in the early 90’s for her hard and fluid character style, she gained popularity as one of the few females excelling beyond her peers in the male-dominated graffiti scene. 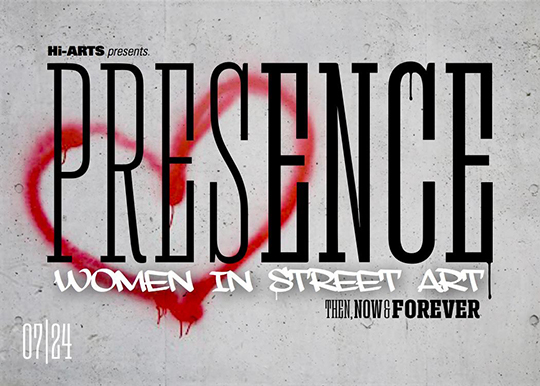 Founder of female arts collectives, like; YOUNITY, LADIES LOVE PROJECT, and PROJECT GIRLZ. 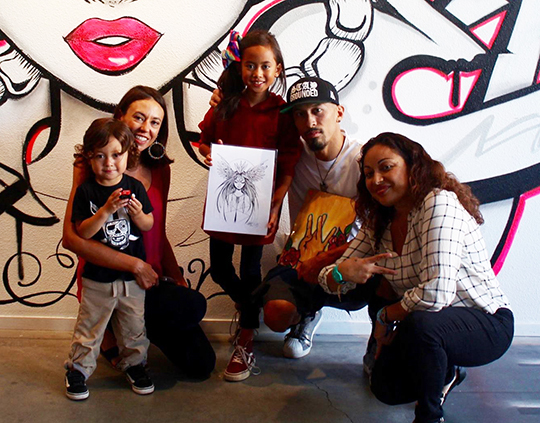 TOOFLY is a full time artist and runs her own independent art & design company; STAY TRU, where she consults, designs, and develops a variety of arts & culture events, as well as workshops. 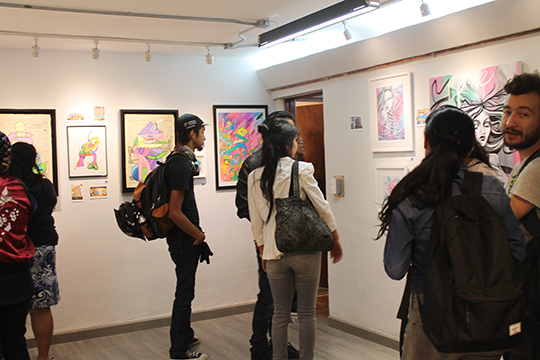 Her work has exhibited at many venues such as the Bronx Museum of Art, CAC; Contemporary Museum of Ecuador, and can be found on public walls internationally. 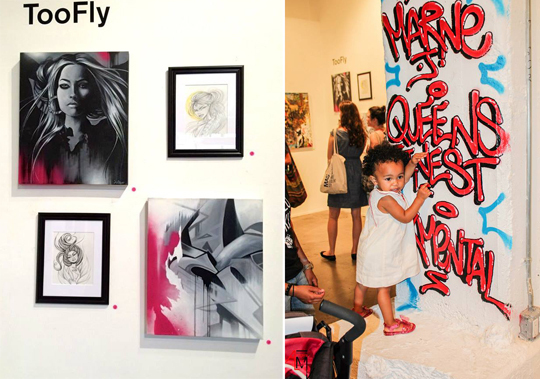 TOOFLY is featured across media outlets like Graffiti Women, Outdoor Gallery, Juxtapoz, and Latina Magazine. 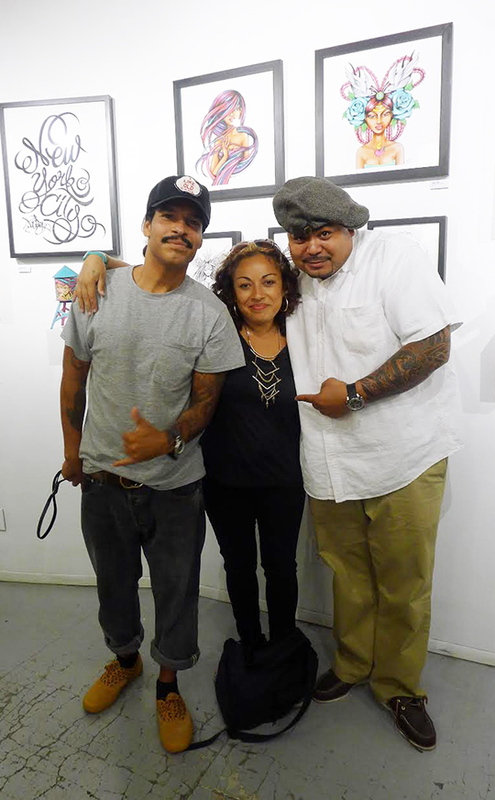 Leslie Lopez, known as “DIME” is a Xicana Graffiti Writer, Educator, and first generation Mexican-American born and raised in East Oakland. 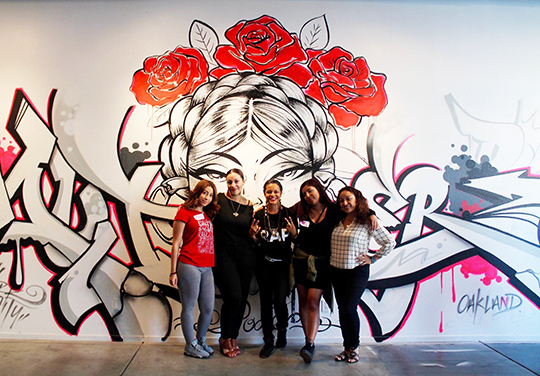 DIME, A lifelong artist carrying on intergenerational traditions of cultural and spiritual resistance in her family began painting graffiti as a young teenager. Through her politicalization within the Xicana Movement and Oakland’s Eastside Arts Alliance she developed into a educator, organizer and public artist for community empowerment, healing, and self determination. Being one of the few women writers of her generation in Oakland, Dime developed a strong bond with the new rising generation of young women and used it as an opportunity to build a sisterhood and mentorship through a course she developed and taught to Middle School and High School young women called SHE’Rose. 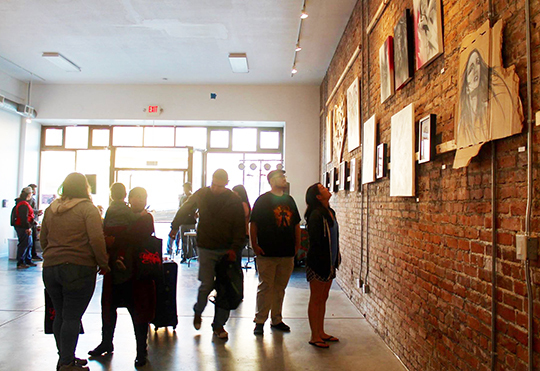 DIME is part of the EASTSide Arts Alliance Cultural Center. A member of BSK, Bomb Squad Kingz, one of the first graffiti crews in Oakland, Ca. put together by Style, Phresh, and West who were part of the first dozen of original graffers of Oakland to ever put paint on the walls of the city in the early 80′s. 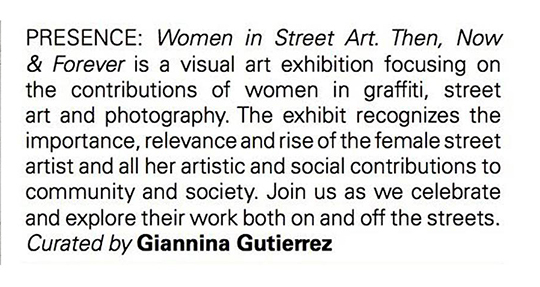 She is also part of Few and Far Women since it Originated in Oakland in 2011 it’s a collective of women artist, skaters, and photographers from around the world. 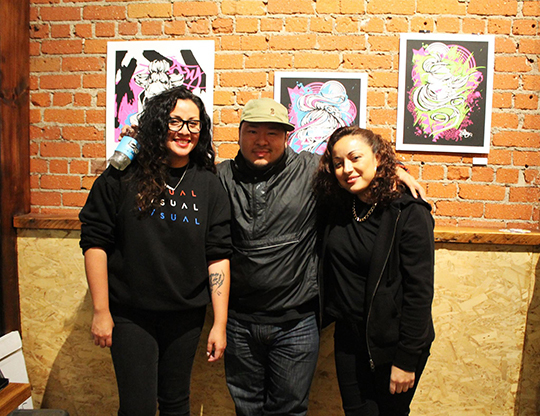 DIME has worked collaboratively as part of Xochitlceive Collective and as an apprentice with Jesus Barraza from Dignidad Rebelde. 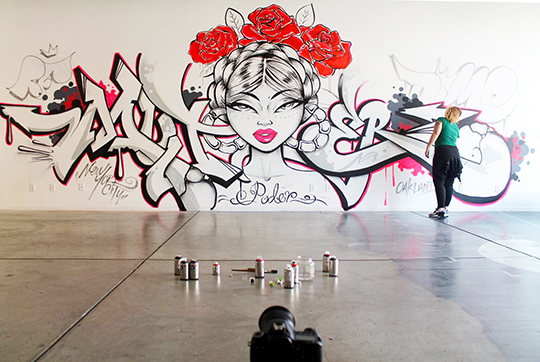 Her collaborations are painted with youth and are seen in walls all around the city and beyond, including in marches and rallies reaching an intergenerational audience. 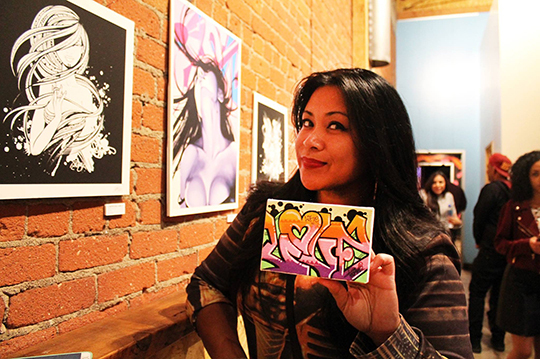 Her work bridges graffiti and fine arts, as a muralist, printmaker, and mentor passing down teachings of her ancestors to all generations. 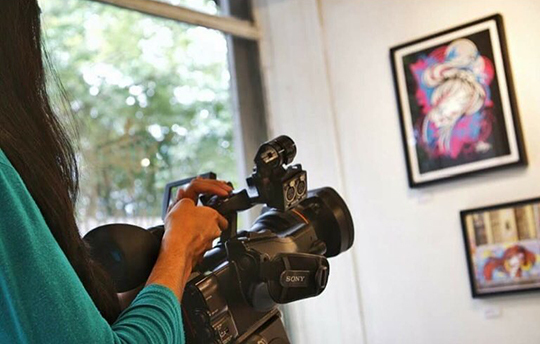 Her passion and goal is to use art not only as a tool for social justice but as a tool for violence prevention, to reach young people, and entire communities and use art and Muralismo to cope, create change and empower. 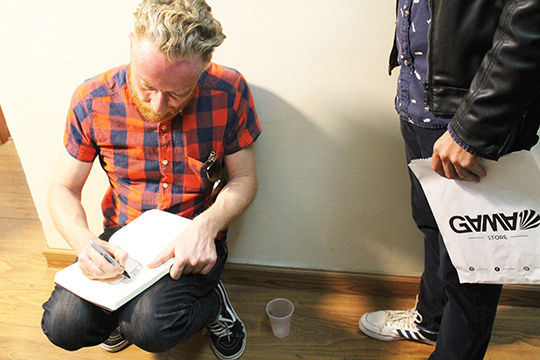 The Mexico City Trip is a wrap! 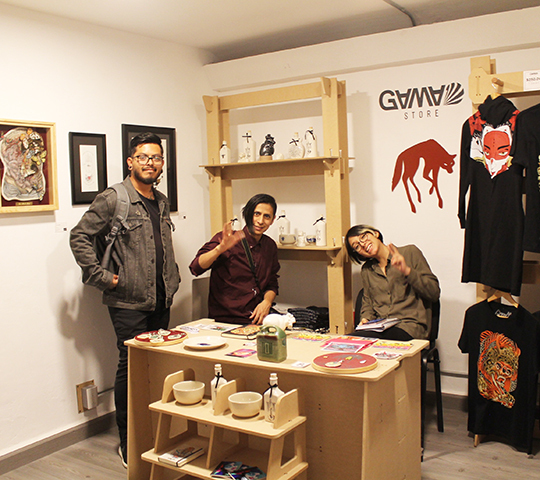 —- I want to give a special shout out to hommie Daniel, curator of Gama Gallery, and street art projects in El DF. I met Daniel at Latido Americano in Peru last year and we talked about the possibility of working together next time I was in Mexico. I had been to the beautiful beaches and towns of Tulum, as well as Playa del Carmen/Cancun etc, but I had never visited any other part of Mexico. 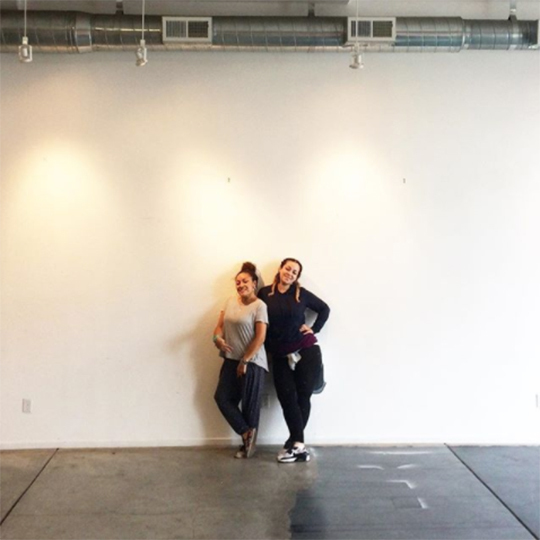 Gama gallery was now eight months old and it felt like the perfect time to pack and go! 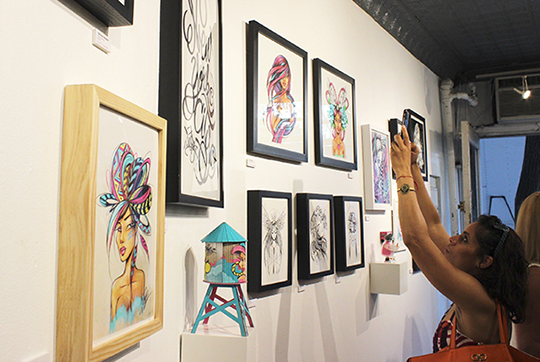 The gallery has been running successful workshops with various illustrators and designers since late last fall and the arts community has caught on to the amazing talent coming out of Gama. During our trip it got a chance to team up with Alianza Francesa of Mexico and schedule us in to do presentations alongside Pablito Zago who was invited form France. 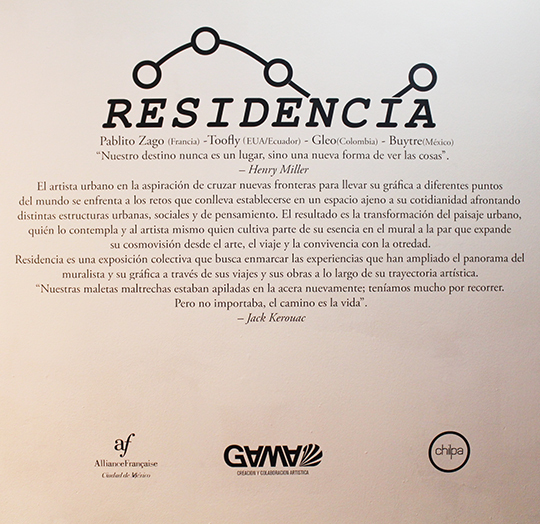 ”Residencia” was born – a group exhibition with local and international traveling artists. 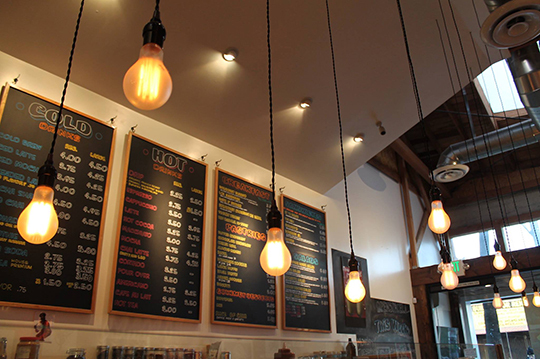 It’s where it’s at, and I’m am loving the idea. Sending lot’s of love to my friend DJ Ski-Hi from NYC who I learned is living in Mexico City with his wife who hosted me for two weeks in their beautiful home. THANK YOU! I’m a little backed up again on posts guys! Had a hectic schedule this fall, but no complaints. I enjoyed myself. 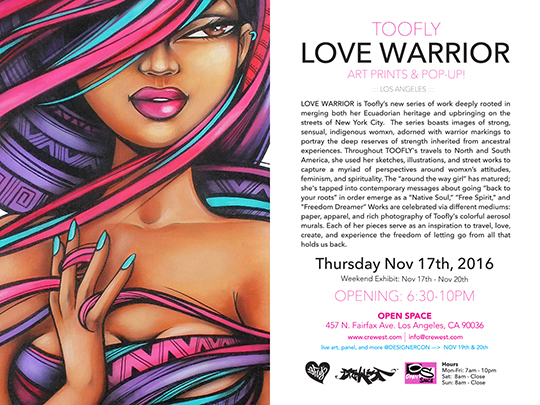 This year I made a quick stop in Los Angeles, for my “Love Warrior Print & Pop-Up” held at Open Space LA. Now that the series is 90% complete, I’m packing them up and taking them to every city I visit. 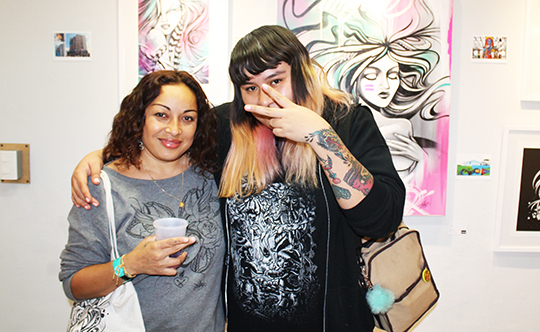 Man One from Crewest Studios and I got a chance to co-curate and also make time for some Designer Con action. Alex and I worked great together. 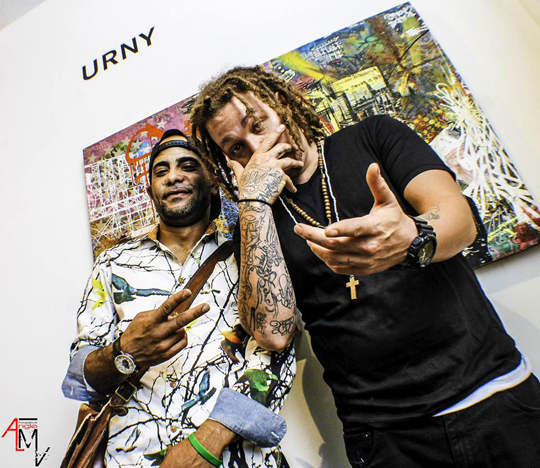 I was happy we had the time to build and relate to a ton of things going on in the art world. 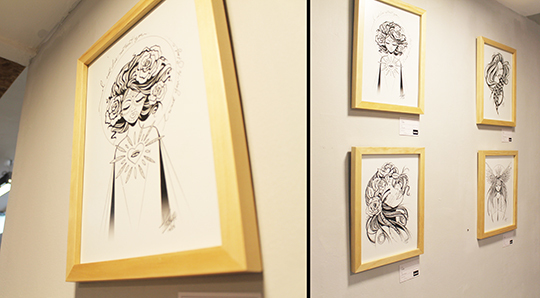 Spaces are hard to come by sometimes, but Open Space LA had the perfect size brick wall to hang my latest series. I had a hard time keeping them up on the wall, but that’s ok. Who would of known puddy would be such hell!!! – Oh well, at least they held up as long as they could enough for folks to check them out, and connect. That’s what’s important, and why DJ Synapse and I went on for long hours on deep conversations about the world. Ha ha! I’m all about that kind of atmosphere, and cozy vibe. 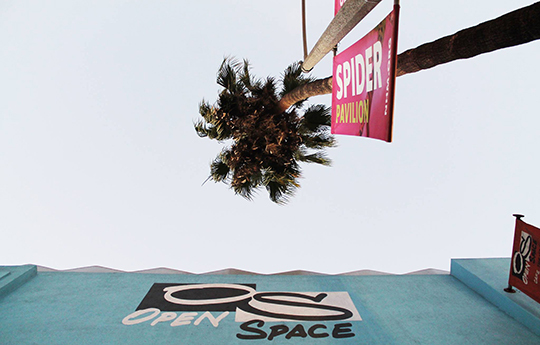 Open Space was a nice space to invite my NY/LA friends to kick-it and for Synapse to spin. 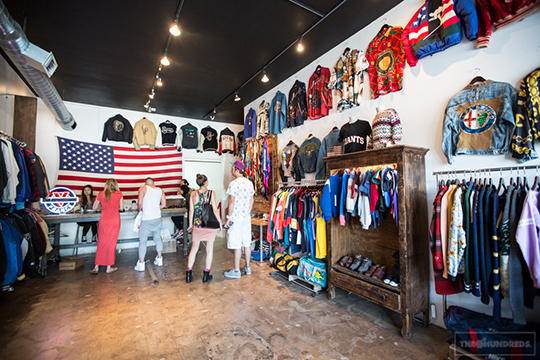 The fairfax strip is chill, a little too much mens street wear for one street but cool for a weekend pop-up. 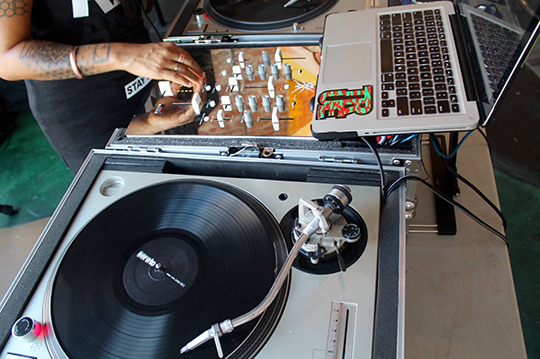 Shout out to our friends Tried & True, and FCNY for holding it down for all the fellas. I guess the ladies can rock the gear in smalls and mediums till a ladies street brand pop-up! Till then supporting your homegirls when we are in town rocks. Thank you for the print love Ricky! 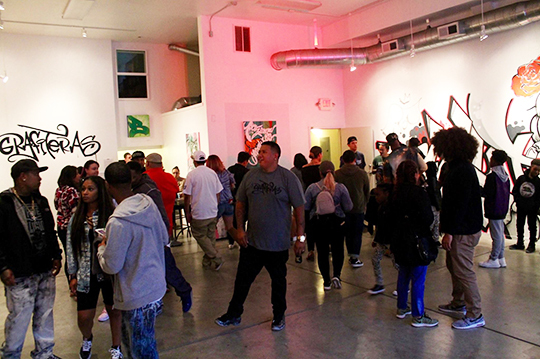 — mad love to our new and true school LA friends; ManOne, Scott, Open Space LA, Dj Synapse, Ritzy, Kano, Ricky, Drew, Tried & True hommies, One 9, Cynthia Kelley, and everyone who came thru to show love and support. I’ll be back for round 3 next November! 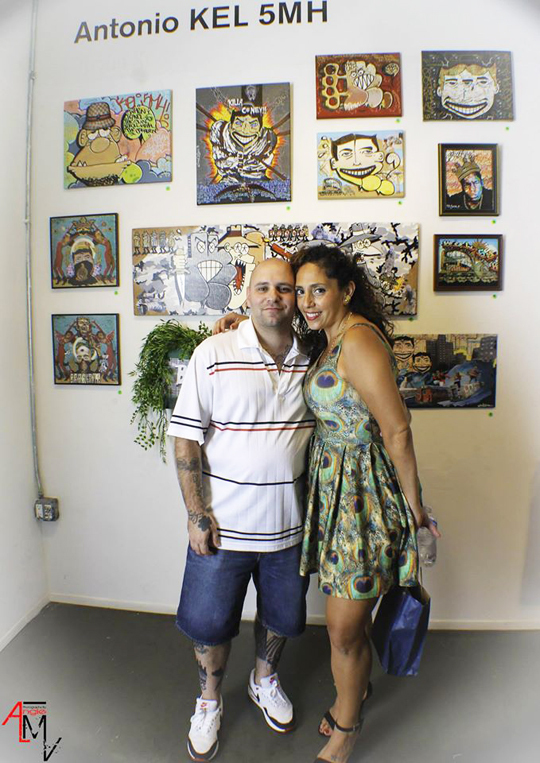 @alfienumeric Thanks for the interview and canvas love! I’m ready for fall! This year I decided to head back to Cali. It’s been a minute since I took a trip to the westside, and visited my friends and family. As much as I love New York every now and then you gotta switch things up. The world is really big, and the more I create new prints, and designs the more I want to visit other places to exhibit them. It’s easier to pack and go these days, especially if you have the time and means to make it happen. #WHYNOT I say. Today, many artists can travel anywhere they want because all you need is a pencil and paper to create just about anything your little heart desires. “Visualization” is key. All you gotta do is show up to that life! 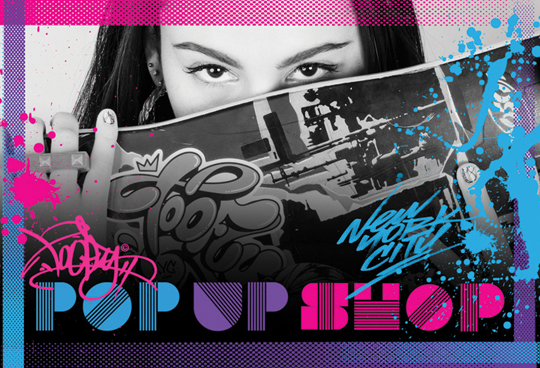 aka pop-up:) There’s a ton of cities across the globe where we can showcase artwork, paint murals, and build/network with the local community. 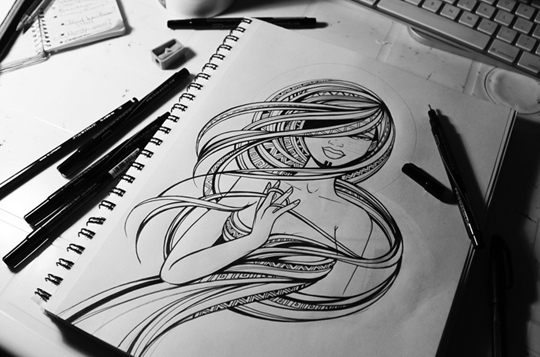 Indefinitely if your about it on the really real your ART becomes your LIFE. That’s how we livin’ ya’ll! 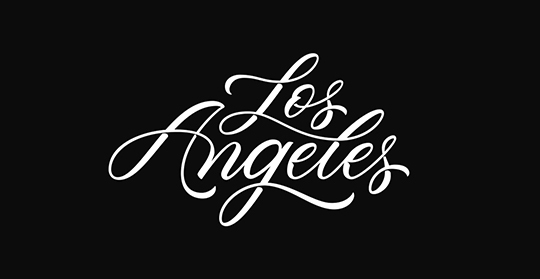 – see you soon LA. 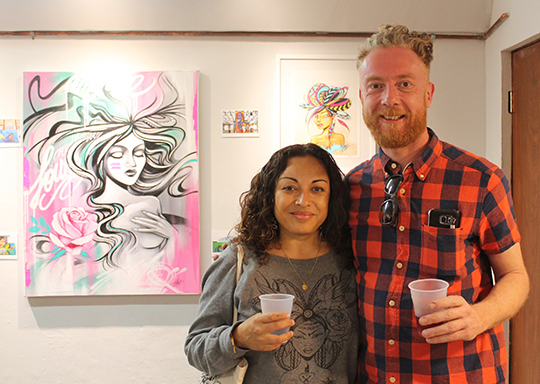 The #LoveWarrior art print exhibition this summer was lovely!!! THANK YOU NEW YORK. 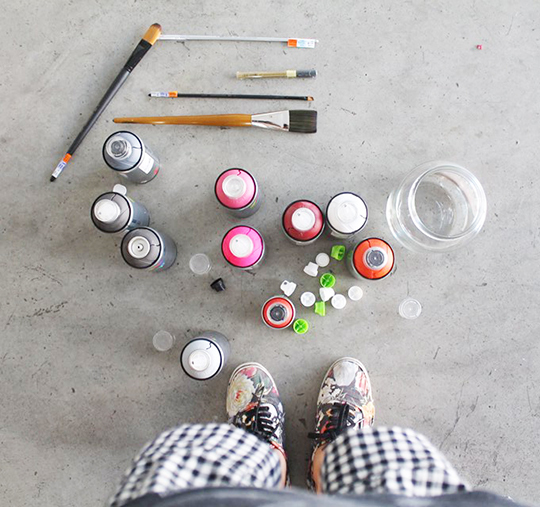 I am very happy I teamed up with @MyPlasticHeart to introduce ::: ALL ::: of my new print works. I’ve been working on the series since 2012. It has been a long process. One that materialized from new found love, and timeless freedom to create. The dedicated work ethic is in all of us if we can take it seriously. Sometimes it’s years before your next “heart felt” experience…when it hit’s you, you have to ride that wave of bliss all the way to the end. Folks…this is not pop art, or an urban art style almost anyone can replicate using technology, high contrast photo icons, and splattered paint with graffiti tags. Anyone bored of that yet? – This, and other reasons why the illustrations in this series spotlight something completely new to bring ya’ll back to what original works of art look, and feel like. Honestly, we need it. Freedom Dreamer, Mas Amor, Free Spirit and the rest of the series are meant to be “felt” by the human heart, and vibrate back. Screens divide many of us these days, it’s nice that we can re-connect live and direct. For those of you who can appreciate all of what I am talking about in this post ((( Thank You ))) I refuse to compromise to anything else. Your attendance at the opening meant a lot to me for all these reasons and more. I am not in New York as often, and in time it will be less and less. 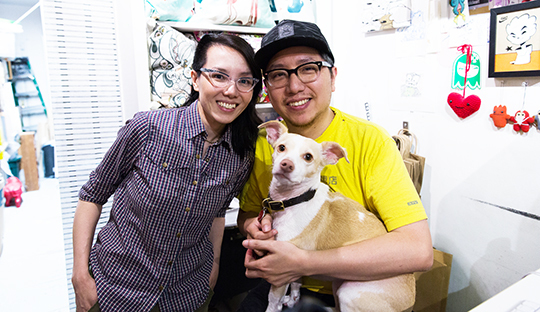 From now on each event, workshop, exhibit, wall, or pop-up will be organized with special care so that we can meet once again as a creative family. WE BUILT THIS CITY!!! 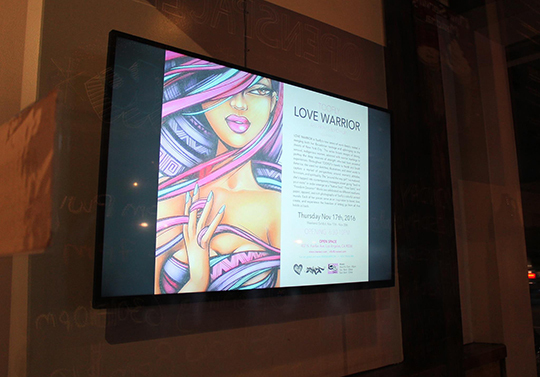 — Shout out to the beautiful, and diverse group of individuals who took part in the #lovewarrior experience. In case you missed it —-> here’s a few photos by Alexandra Henry and TF. Video by Nancy Burneo coming soon!!! Once we get that the post will be complete. 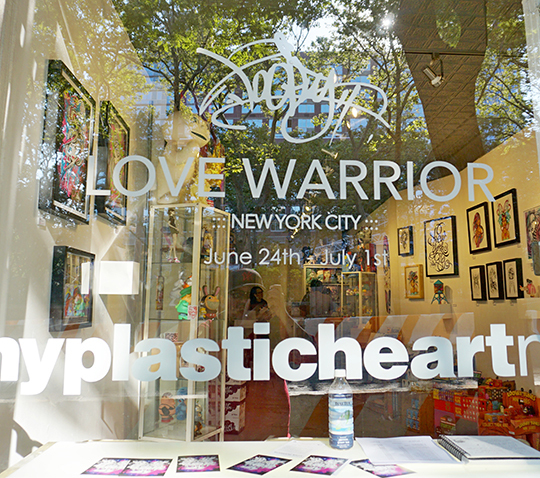 TOOFLY “LOVE WARRIOR” ART PRINT EXHIBITION at My Plastic Heart / New York City. 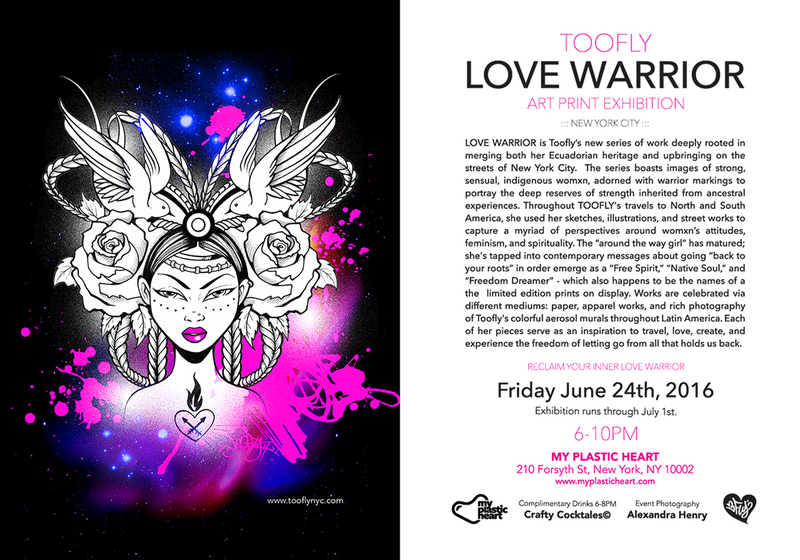 New York City, New York—May 24th, 2016—A month from now, world renowned street artist, designer, and social entrepreneur, Maria “TOOFLY” Castillo brings together the complete “LOVE WARRIOR” ART PRINT series to New York City’s My Plastic Heart Gallery on Friday, June 24th, 2016. 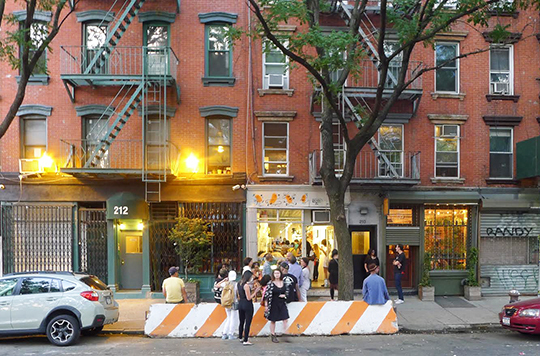 An anticipated exhibition in the heart of downtown’s Lower East Side. 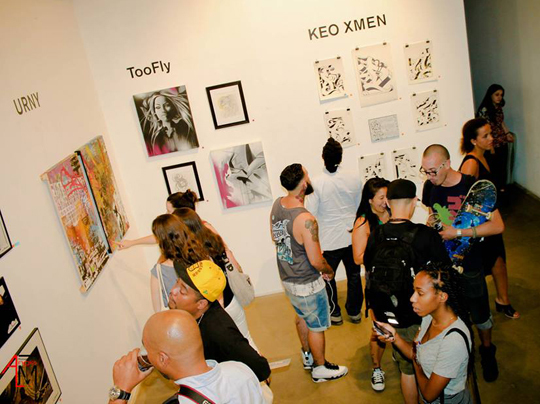 Held from 6PM to 10PM, arts enthusiasts, tastemakers, press and friends will get to view the series that inspired a completely new direction for TOOFLY. Admiring a palpable presence of feminine power immersed in the rising spiritual. 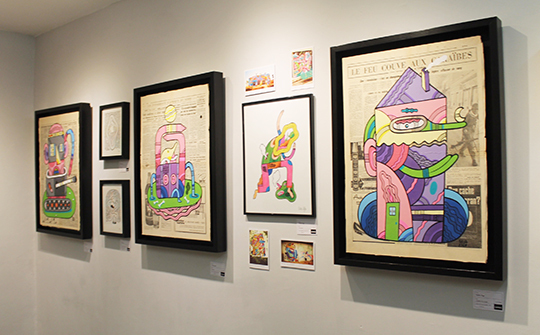 The exhibition will run for one week June 24th – July 1st. 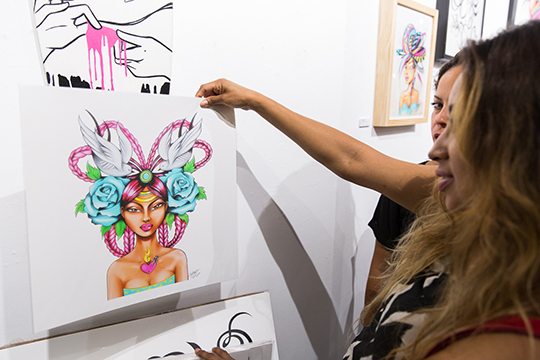 LOVE WARRIOR is Toofly’s new series of work deeply rooted in merging both her Ecuadorian heritage and upbringing on the streets of New York City. 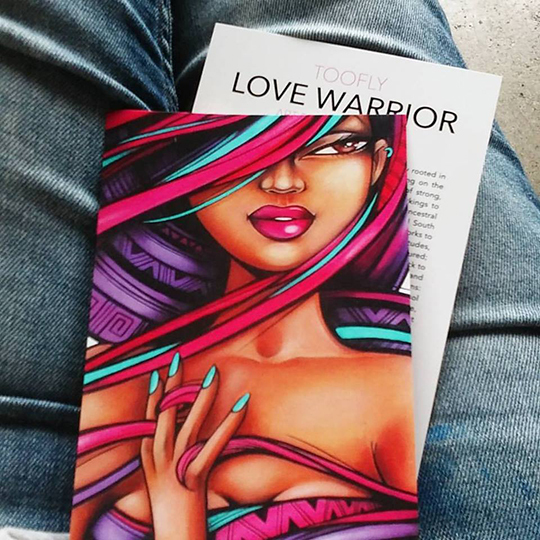 The series boasts images of strong, sensual, indigenous womxn, adorned with warrior markings to portray the deep reserves of strength inherited from ancestral experiences. 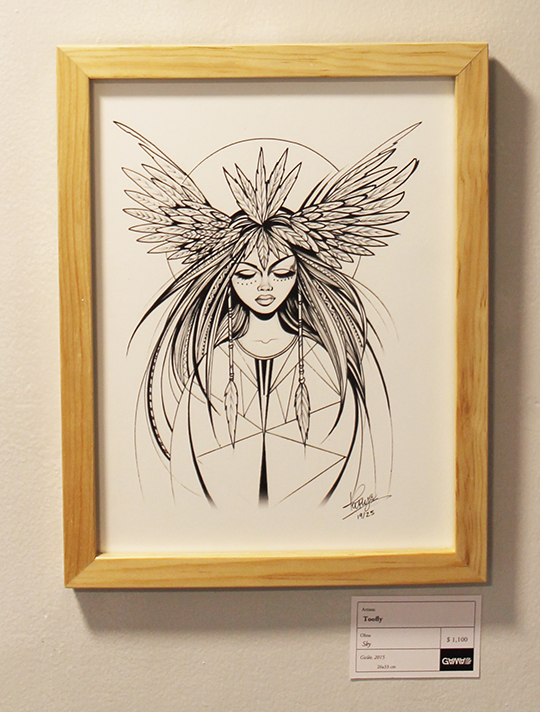 Throughout TOOFLY’s travels to North and South America, she used her sketches, illustrations, and street works to capture a myriad of perspectives around womxn’s attitudes, feminism, and spirituality. 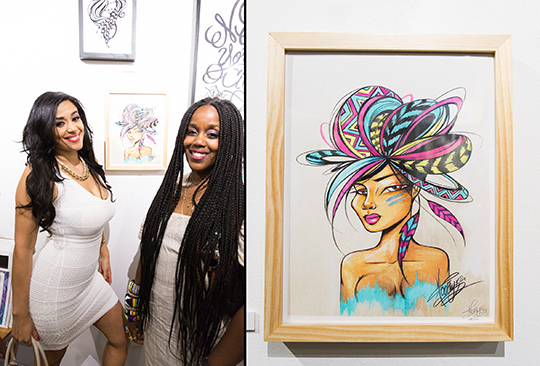 The “around the way girl” has matured; she’s tapped into contemporary messages about going “back to your roots” in order emerge as a “Free Spirit,” “Native Soul,” and “Freedom Dreamer” – which also happens to be the names of a few limited edition prints on display. 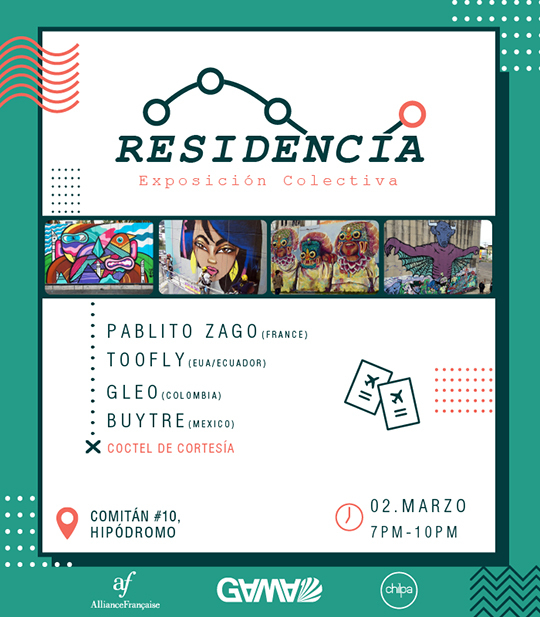 Works are celebrated via different mediums: paper, apparel works, and rich photography of TOOFLY’s colorful aerosol murals throughout Latin America. 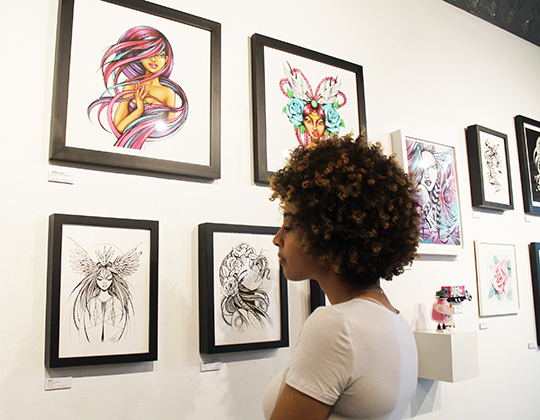 Each of her pieces serve as an inspiration to travel, love, create, and experience the freedom of letting go from all that holds us back. 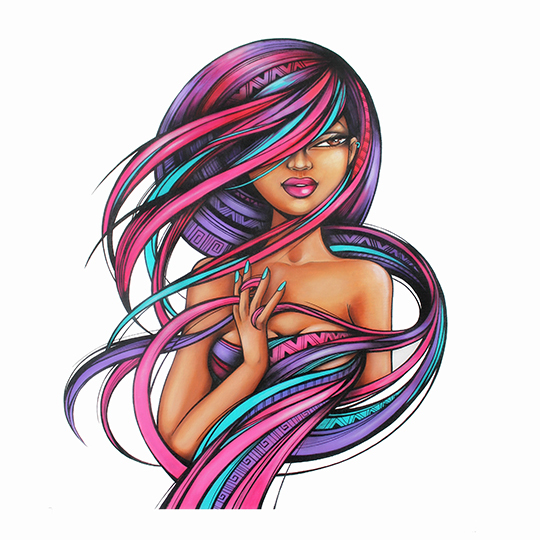 Exclusive Print Release 16″X16″ of “Native Soul”, and Free Spirit. 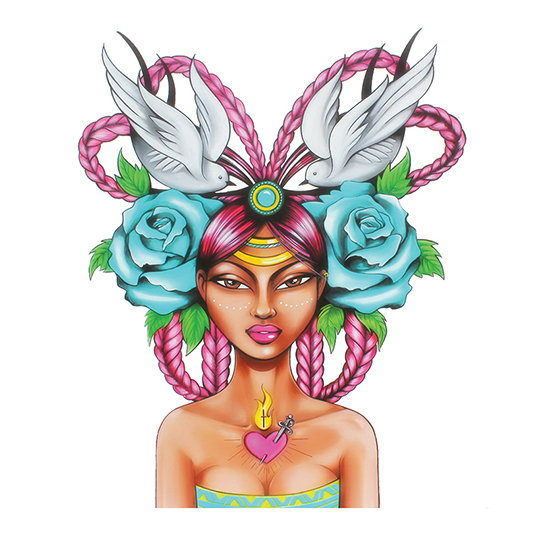 Toofly Shop: Prints, T-Shirts, Tank Tops, Stickers, Notebooks, and more available to purchase for 1 week at My Plastic Heart June 24th -July 1st. 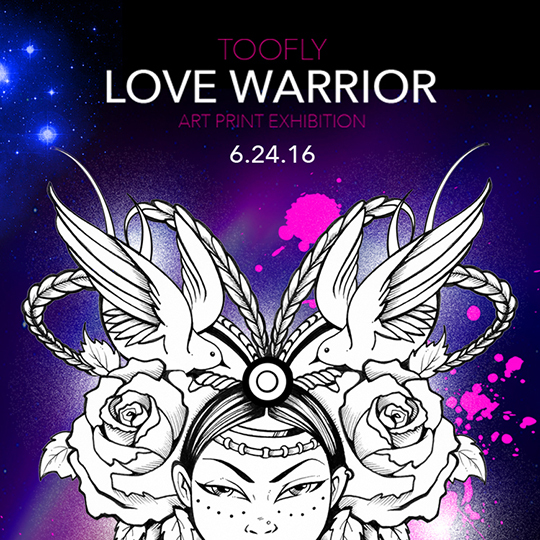 Follow @Toofly_Shop on Instagram and #tooflyshop #lovewarrior hashtags for special deals leading up to the opening! The original ink drawing was damaged by my ice tray ( bad habit ) but I scanned and cleaned it up in photoshop to save the digital image. 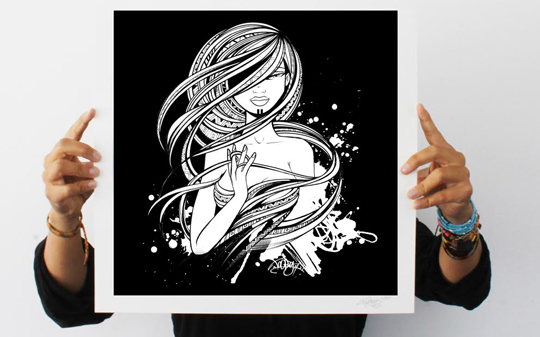 I made a 16″X 16″ black & white giclee print that many loved and went on to become a limited line of totes at the pop-up shops held in summer and Holiday. 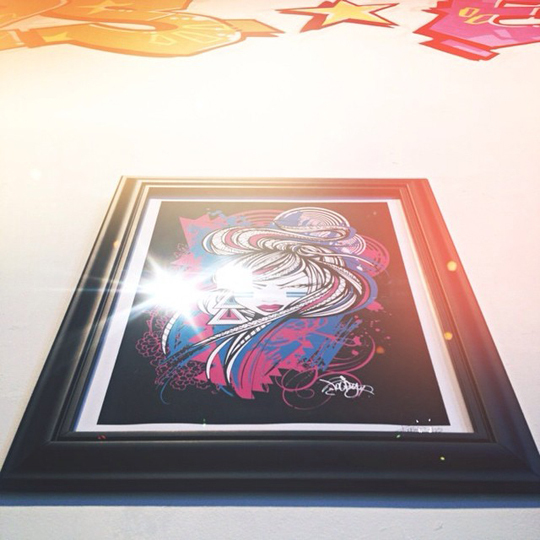 The print is available on the shop ( limited QTY ) —> www.tooflynyc.com/shop $100.00US – ships worldwide. Because April is a super rainy month in Ecuador, I decided it was the perfect time to start painting! I can’t go outside my patio much to soak up some sunshine and care for my garden. 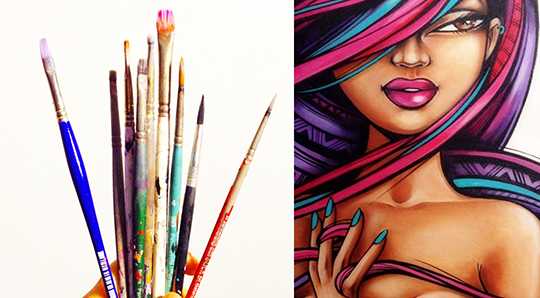 I’m indoors with music, paint, and an array of illustrations that are ready to bloom. Construction of my art studio is on hold for now so I set up a little corner in my office to rock. 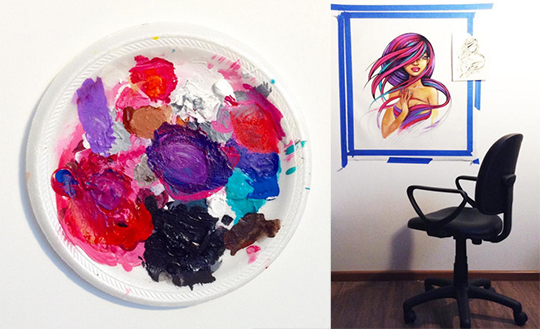 I can’t wait to have a whole floor dedicated to my paintings! I get excited when I think about it. When it’s ready I will go BIG YEO! Until then Native Soul, and the entire LOVE WARRIOR series will take form day by day. 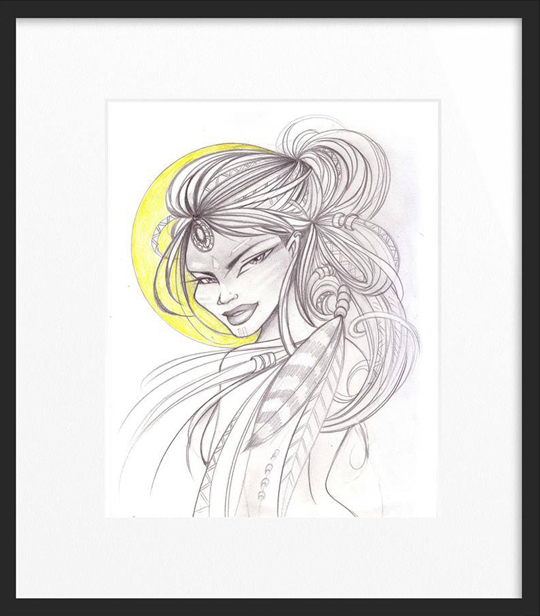 Will this become a print by June’s “Love Warrior Art Print Exhibit ” at my Plastic Heart ??? not sure…follow IG! and save the date JUNE 24th NYC!!! 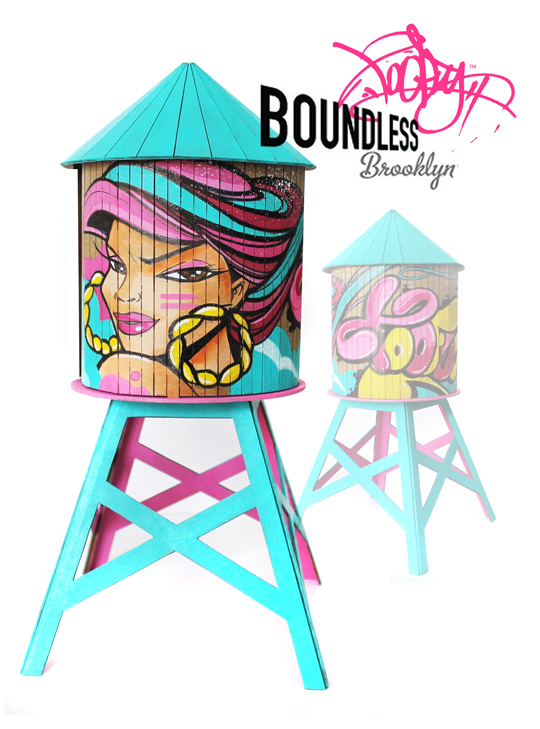 The customized Brooklyn Tower Kit – by some really dope illustrators, graffiti artists, and toy designers will be on display on November 1st 2014 in the heart of the Lower East Side! 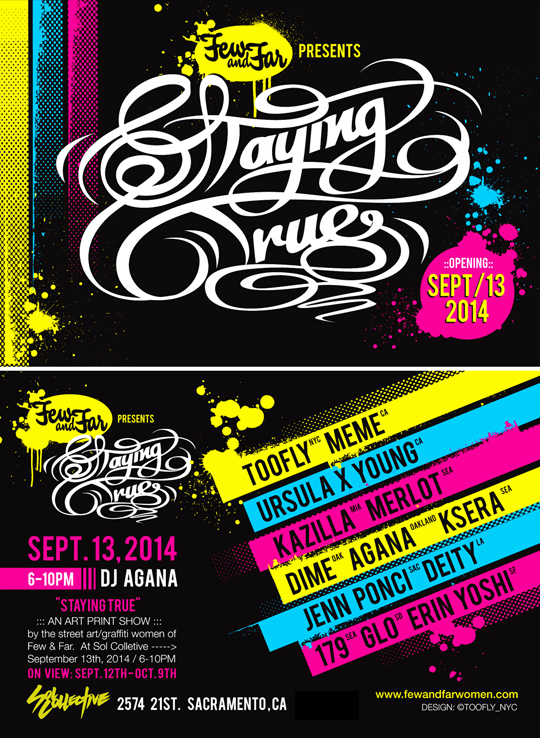 The Boundless Brooklyn exhibit ” The Art of the Tag ” at My Plastic Heart is going to be a pretty cool show. I don’t do many custom works anymore, but sometimes some are too cool to pass up. Love my tower! 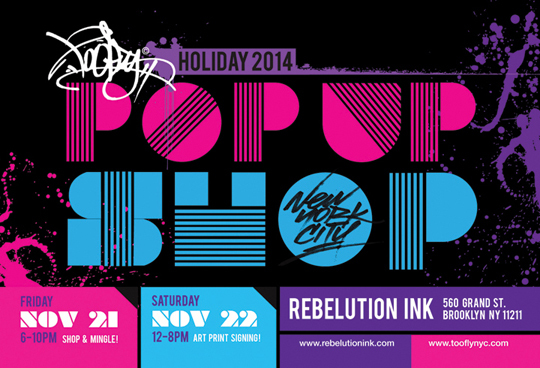 Be sure to check it out TOOFLY, MARKA27, KANO, ROYCE BANNON, MATT SIREN, and more! 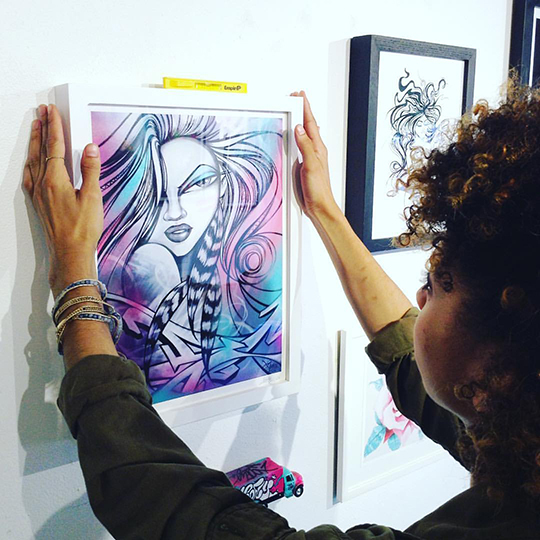 Opening Night: Saturday, November 1st // 7:00 p.m. – 10 p.m.
Few and Far is an assemblage of women who beautify the streets. In a shared commitment to creativity, education and social justice we draw, paint, skateboard and teach all over the globe. 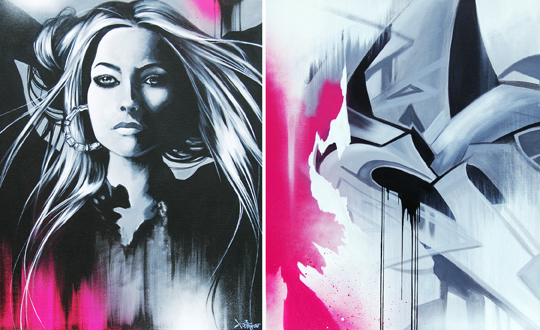 Street art is an international, visual language that ever evolves. 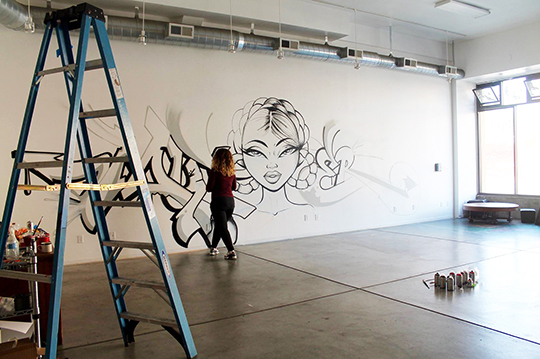 A mural is a story and each artist takes her turn in the telling. 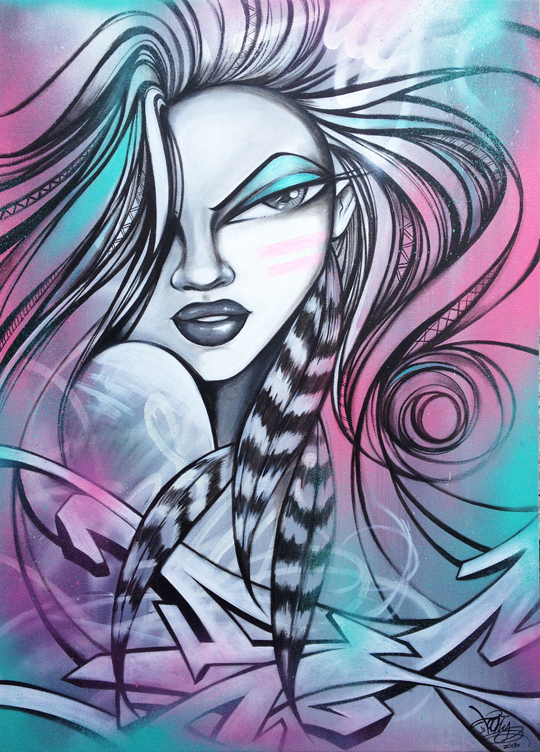 Using our gifts as totem makers, Few and Far’s reflection of the world is fantastic and distinctly feminine. By engaging our community in our narrative, we seek to foster young imagination, to help the neighborhood’s next generation recognize and channel their creative impulses. This conversation between artistsand communities is an ongoing, global project to heal and bring together all peoples. 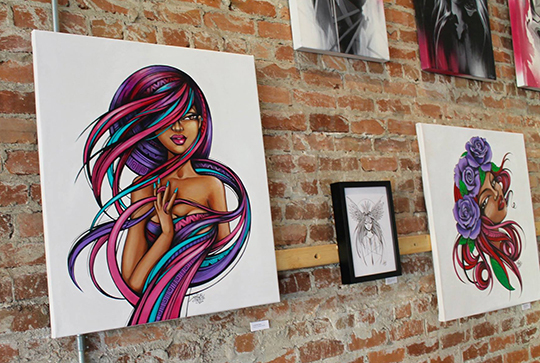 Staying True The women from Few and Far are coming together this September to bring their art indoors for an all-print show in Sacramento. 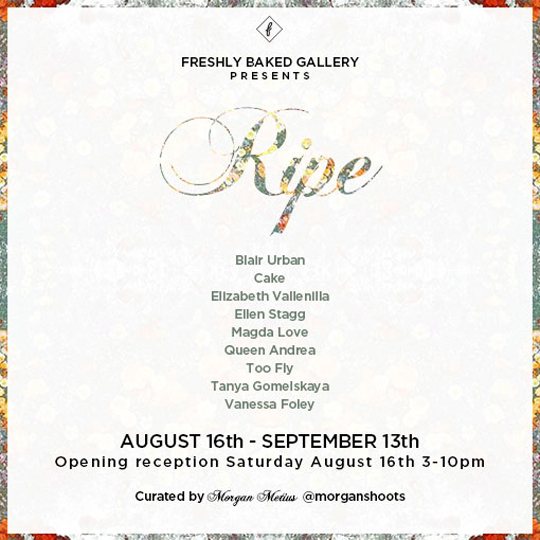 Hailing from Miami, New York and around the West Coast (including Sacramento), this group of 13 women will be showing a collection of framed prints priced under $300. Few and Far have created murals around the world and have several notable large painted walls in Sacramento. 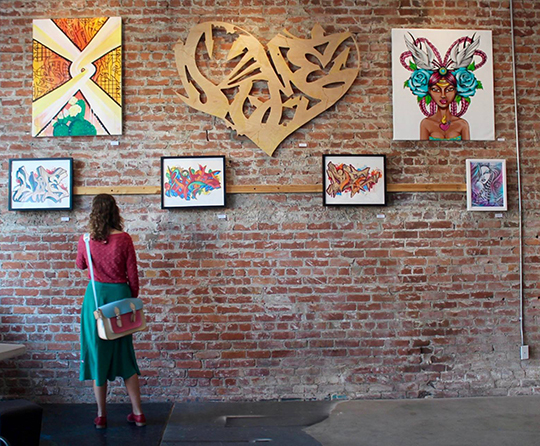 The group show; Staying True will be held at Sol Collective - a non-profit community art center focused on culture and activism. 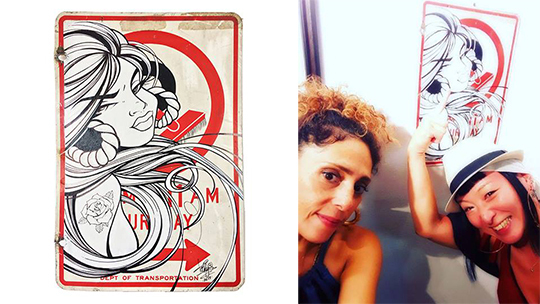 On view until Sunday August 24th at Powerhouse Books // 37 Main Street Brooklyn ( Dumbo ) F train to York St.
proud of my ladies! Grew up in the same hood, Corona Queens baby! Destined to meet and build creative worlds together. 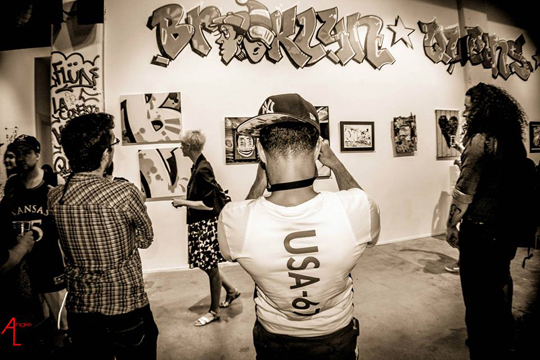 Olivia’s photos from back in the days have a lot of graffiti history from Corona, Queens don’t miss seeing them!!! 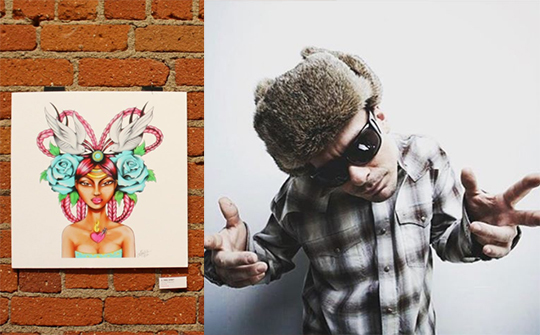 Shout out to the peeps – THE NATURALS, THE OUTSIDERS and YKK. Shout out to Angie LM Vasquez for the flicks! 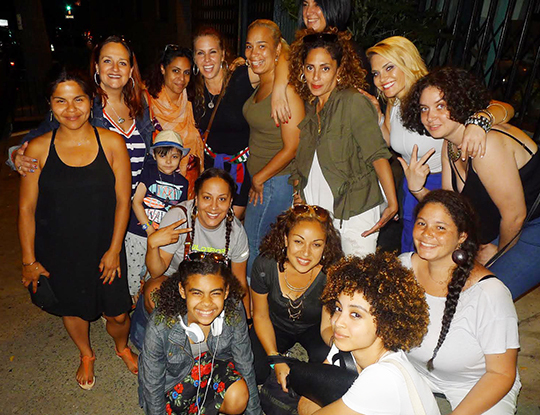 and to everyone who supported the fam on a lovely summer night in Dumbo Brooklyn. It’s a small world! Eventually the kids from the 90′s all grown up and destined to re-unite and celebrate true school style and native NY flava.